Box Text: Moose on the Loose or Squirrely Heroes! An all-new episode in Bullwinkle's life when he finds out he's the Lost Earl of Moosechester! He and his pal, Rocket J. Squirrel must get from Frostbite Falls, Minnesota to the Abombinable Manor in England in order for him to collect his inheritence. Problem is, those two no-Goodniks, Boris Badenov and Natasha Fatale are after the same fortune. As Bullwinkle, you'll lock antlers with all sorts of dastardly enemies while avoiding Boris and Natasha's bombastic attacks. Or, as Rocky the Flying Squirrel, you'll soar into action against villains armed with goof-gas. Are you Moose enough for this challenge? Stay tuned! Do powerful headbutts as a rampaging moose! Dive-bomb the bad guys in classic squirrel fashion! Switch from Bullwinkle to Rocky instantly - whatever the situation needs! 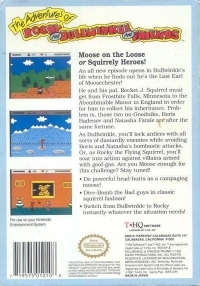 08-20-2011 atariboy Box Text Moose on the Loose or Squirrely Heroes! An all-new episode in Bullwinkle's life when he finds out he's the Lost Earl of Moosechester! He and his pal, Rocket J. Squirrel must get from Frostbite Falls, Minnesota to the Abombinable Manor in England in order for him to collect his inheritence. Problem is, those two no-Goodniks, Boris Badenov and Natasha Fatale are after the same fortune. 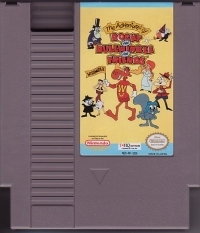 As Bullwinkle, you'll lock antlers with all sorts of dastardly enemies while avoiding Boris and Natasha's bombastic attacks. Or, as Rocky the Flying Squirrel, you'll soar into action against villains armed with goof-gas. Are you Moose enough for this challenge? Stay tuned! Do powerful headbutts as a rampaging moose! Dive-bomb the bad guys in classic squirrel fashion! Switch from Bullwinkle to Rocky instantly - whatever the situation needs! 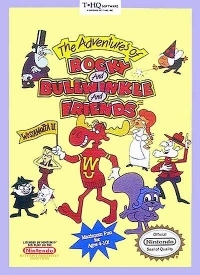 This is a list of VGCollect users who have Adventures of Rocky & Bullwinkle and Friends, The in their Collection. This is a list of VGCollect users who have Adventures of Rocky & Bullwinkle and Friends, The in their Sell List. This is a list of VGCollect users who have Adventures of Rocky & Bullwinkle and Friends, The in their Wish List.